Jamie Foxx had a weird night, but hitting on another man’s wife is probably not the best way to make friends. Jay Z and Beyoncé seemed very bothered by Foxx’s comments. 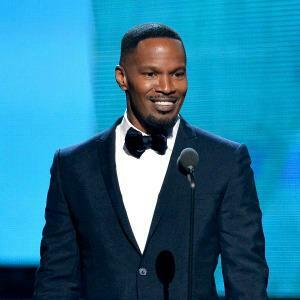 Jamie Foxx showed up to the Grammy Awards on Sunday night with his favorite woman in tow. Foxx brought his daughter Corinne Bishop to the show with him, but it got weird from there. Foxx appeared onstage to present an award, which was won by Jay Z and Justin Timberlake (the latter of whom wasn’t at the awards show). Foxx started out by saying there was a weird smell backstage, but it may have just been a way to say he was high (or drunk) — because he sure acted like he was. As Jay Z and Beyoncé sat in the front row, Foxx spoke directly to them. Both Beyoncé and Jay Z smiled awkwardly at the remark, but they didn’t seem happy. Jay Z had his hand on his wife and appeared to tighten his grasp as Foxx awkwardly hit on her. Jay Z won the award Foxx was presenting, and the two then shared a very awkward hug onstage. The world of Twitter erupted at Foxx’s comments. Foxx is a fan of music, and he said he was most looking forward to seeing Macklemore & Ryan Lewis. The comments he made onstage may start something between him and Jay Z, but there is also a chance he will regret all of it when he wakes up in the morning.